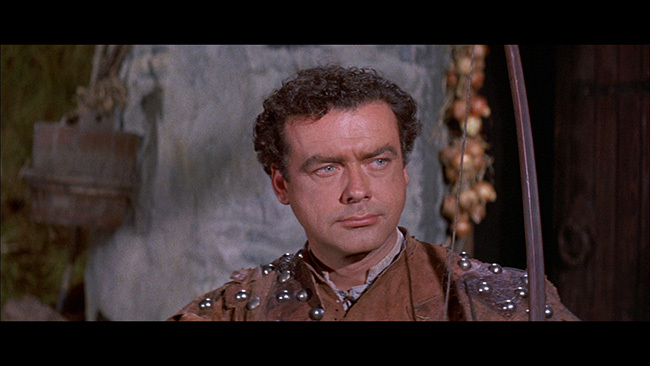 Actor Richard Greene, synonymous with the Robin Hood character thanks to his playing the role in the long running British television series, The Adventures Of Robin Hood, reprises his most famous character for the big screen in Hammer Studio's take on the mythos. 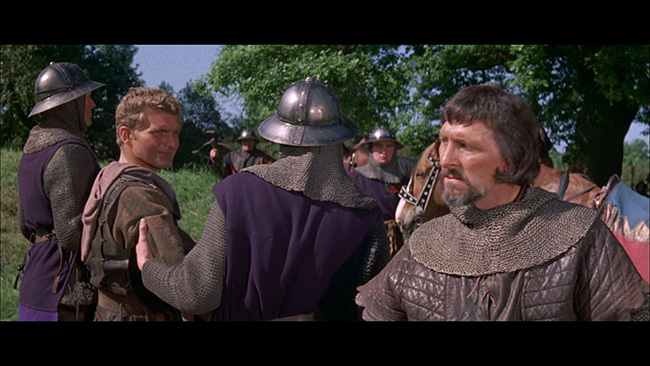 Directed by one of the studio's greatest directors, Terrance Fisher, this film was Hammer's second attempt to bring Robin Hood to the big screen, following the Val Guest directed The Men Of Sherwood Forest from 1954 which saw Don Taylor in the lead role. When the film begins, Robin Hood and his band of merry men come across an injured solider out in the woods. 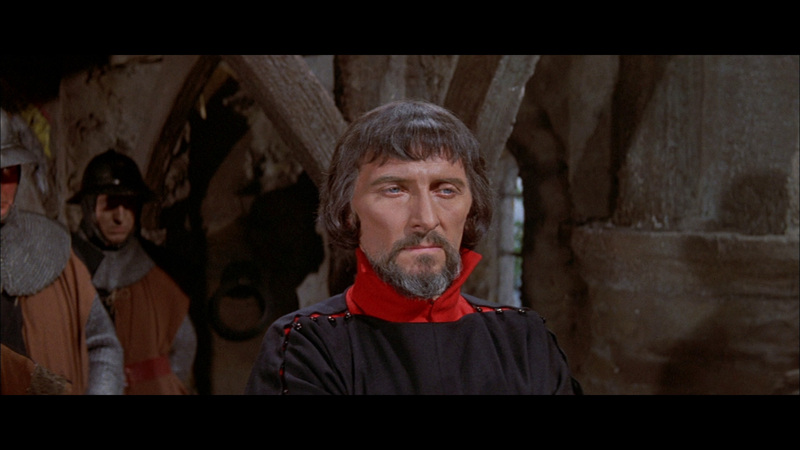 He's been hightailing it away from the evil Sheriff of Nottingham (Peter Cushing) and as it goes with Robin Hood stories, any enemy of the Sheriff's is a kindred spirit. If finding an injured solider weren't lucky enough on its own, Robin Hood also finds a lady skinny dipping in the river - Maid Marion (Sarah Branch). They bicker a bit and she takes off but you just know that she digs him despite her bickering. The next day, Robin Hood finds a note from her stuck to a tree instructing him to meet her in a house outside of the woods. 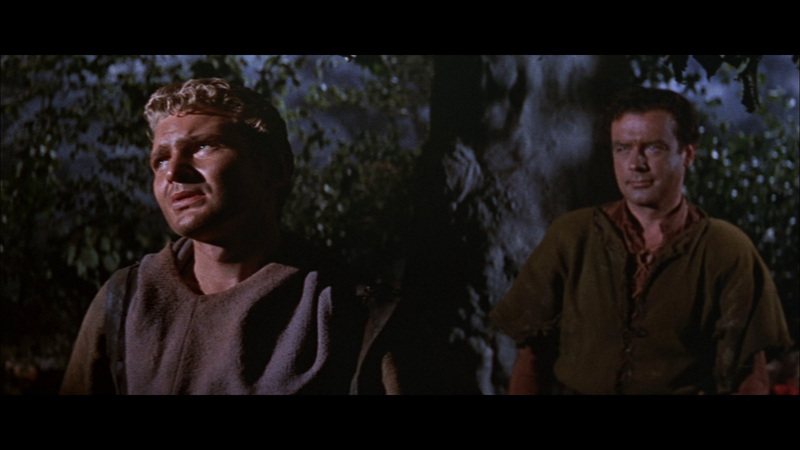 When he shows up, the Sheriff is there and he offers Robin Hood some money and a pardon in exchange for the wounded soldier. Robin Hood, of course, declines as he figures there's got to be more to this than the Sheriff is willing to admit. Soon enough, the injured man dies and Robin Hood and his pals find themselves wrapped up in a plot in which the Sheriff is hoping to buy up land around the town and sell it to his rich friends who will in turn build castles and stuff. Lead by the Earl of Newark (Richard Pasco) and his young crony Lord Melton (Oliver Reed), this plot is not only a threat to the local real estate market but also to the Archbishop of Canterbury, Hubert Walter (Jack Gwilam), who just so happens to be running jolly old England while the King is fighting in France (for reasons never explained). 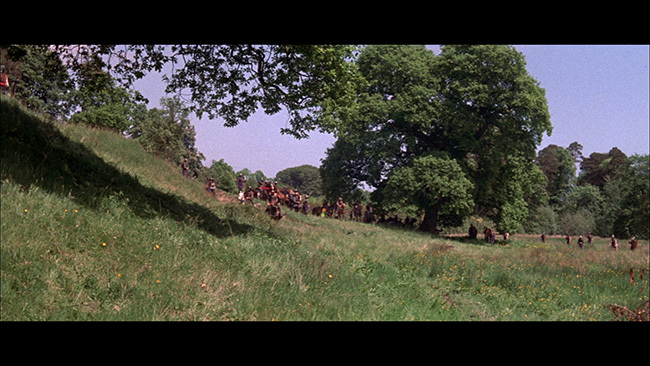 Shot by director of photography Ken Hodges mostly on location in the rural countryside of Ireland, if nothing else Sword Of Sherwood Forest looks very nice. Shot in scope, the cinematography is colorful and elegant and it uses lots of lush greens to bring out the best of the local scenery. 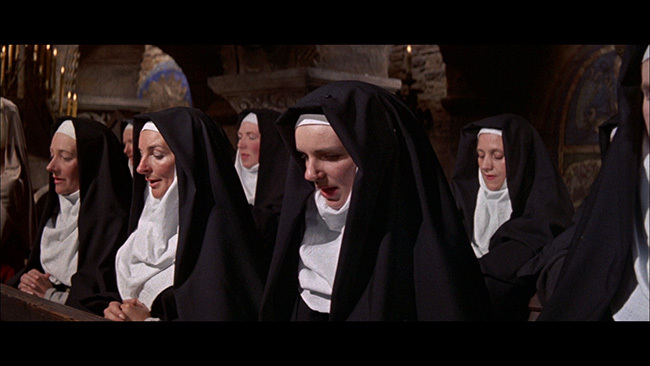 On top of that, the costumes are quite fancy and often make for a nice contrast against the various backgrounds and interiors that appear throughout the movie. Unfortunately, without an interesting script Fisher is only able to do so much. The story takes too long to really get set up, making the first half hour or so fairly plodding, and by the time it's up and running, the conclusion feels rushed. Characters aren't really developed very much and are really just caricatures more than anything else, and it's hard not to feel like we've been here and done this before. That said, the film is entertaining enough even if it doesn't reinvent much of anything. 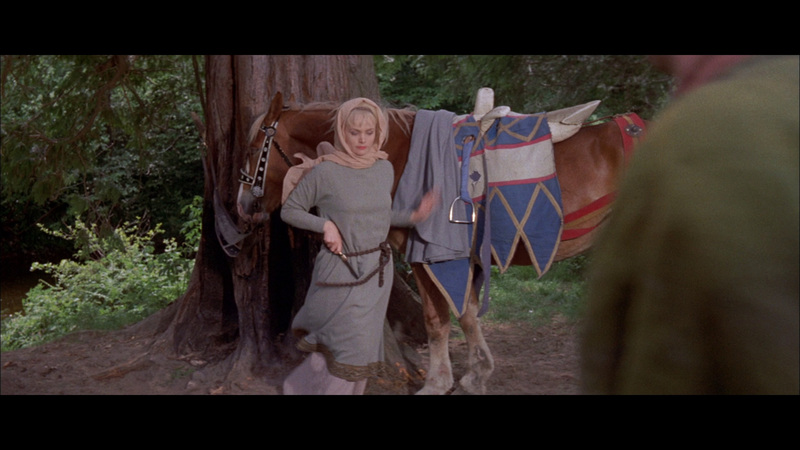 Greene is a little too old to play the lead here and his chemistry with the fetching Ms. Branch is nil, but if nothing else he's at least charming and amusing in the part. The villains steal the show, however, with Cushing doing a fine job as the Sheriff of Nottingham and both Pasco and Reed playing up the more sinister qualities of their characters as well. 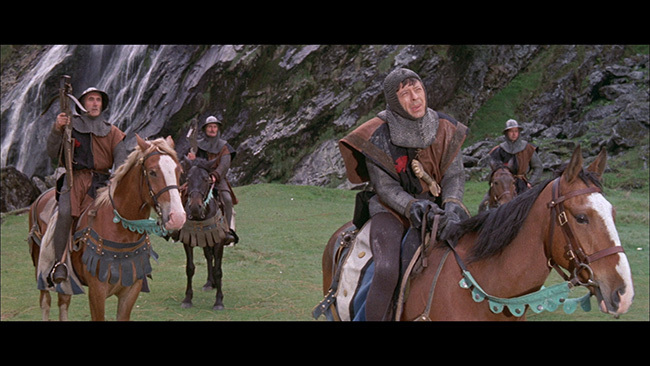 Niall McGuinness is amusing enough in a supporting role as Friar Tuck, offering a bit of comic relief in his perpetually unsuccessful quest to ride his donkey and with his constant wanting of food. 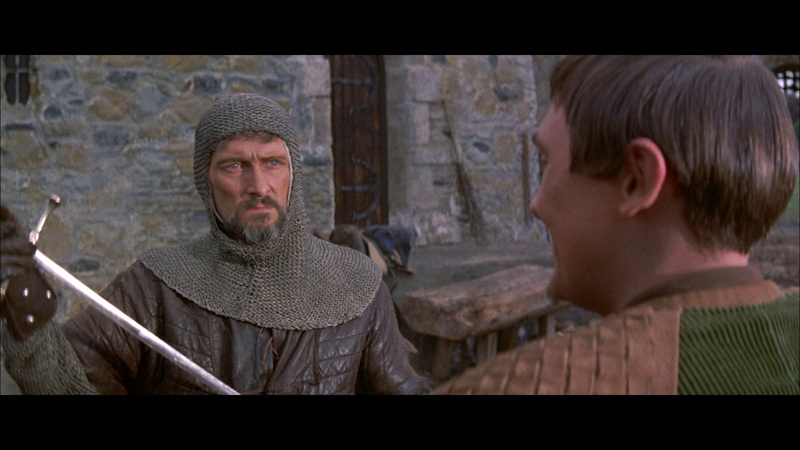 There are a lot of sword fights in the last half hour that are moderately amusing and there's a fair bit of action in the finale but much of the film is literally a retread. 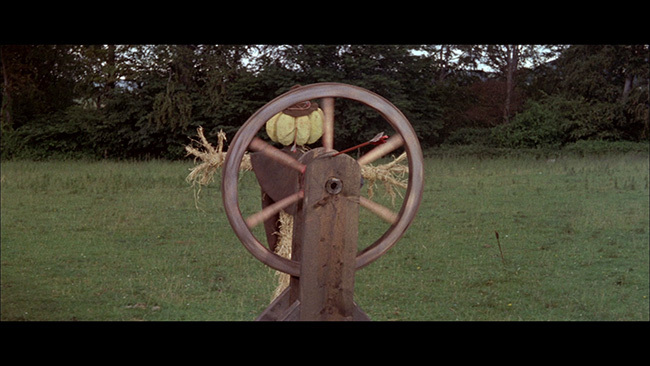 The attempts to differentiate the story from the standard Robin Hood mythos aren't fleshed out very well and suffer from some pretty massive logic gaps (wouldn't the Earl of Newark want to stop Robin Hood from escaping when he knows about his plans?). So yeah, there are flaws aplenty here to quibble over - but yet, there's still a fair bit of entertainment value to be had in spite of all of this. 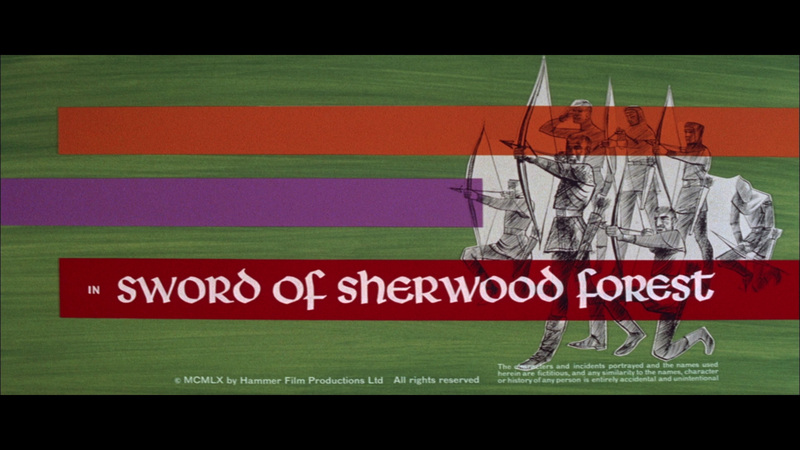 The film isn't a classic and it can't hold a candle to some of the better Robin Hood films that have been made over the years, but Hammer buffs and Robin Hood fans alike should be able to enjoy this one as the light eighty minutes work of disposable entertainment that it is. 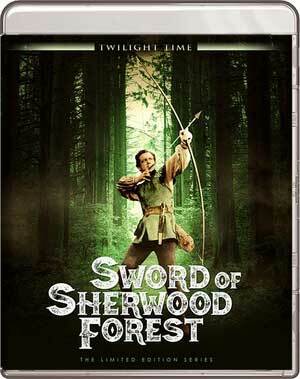 Twilight Time brings Hammer’s Sword Of Sherwood Forest on Blu-ray in an AVC encoded 1080p high definition transfer framed in its proper 2.35.1 aspect ratio. 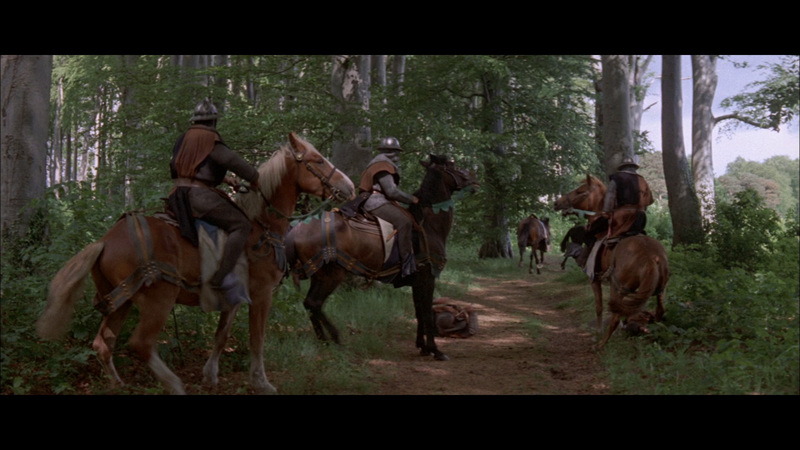 It’s quite a nice looking transfer, boasting great color reproduction and strong black levels. Detail is noticeably improved over the previous DVD edition and there’s better depth and texture here as well. The picture is very clean, showing no real print damage of note, while retaining a natural amount of film grain. 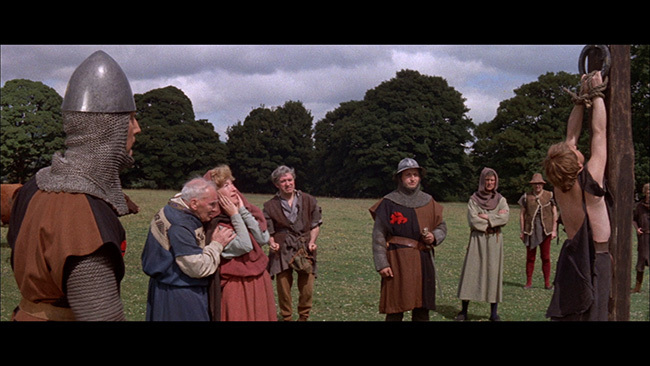 There are no problems with any compression artifacts, edge enhancement or noise reduction issues – all in all, the movie looks really good here. The English language DTS-HD 2.0 Mono track is clean, clear and properly balanced. The score has a bit more power behind it than you might anticipate, while the dialogue is always easy to follow and understand. Optional subtitles are provided in English only. Extras on the disc are limited to the film’s isolated score (in DTS-HD 2.0 format) and a theatrical trailer for the feature as well as menus, chapter selection and an interactive Twilight Time catalogue. 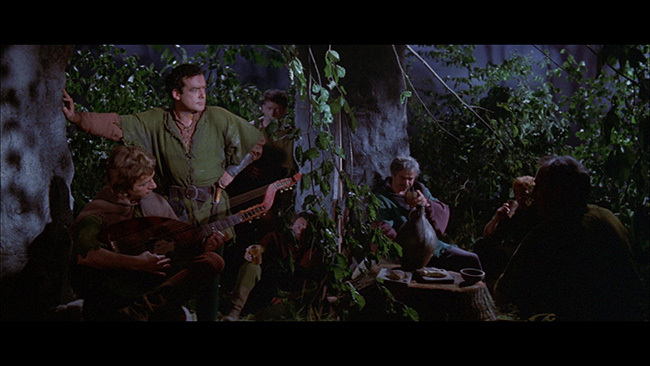 Inside the keepcase, however, is the requisite booklet of liner notes from Twilight Time’s resident essayist, Julie Kirgo wherein she discusses her love of the Robin Hood character and makes some astute observations about the cast of this particular take on the legend. Sword Of Sherwood Forest isn't the greatest Robin Hood film ever made but it's still a lot of fun despite its obvious flaws. Twilight Time’s Blu-ray release is light on extras but the audio and very solid. 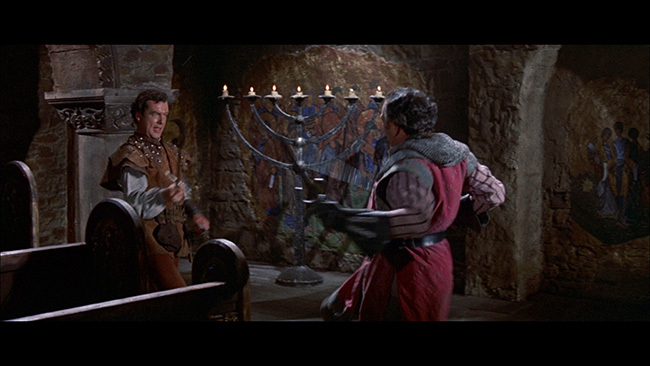 Overall, it's hard not to have fun with this one - it's good entertainment and recommended for Robin Hood fans and Hammer completists alike. Click on the images below for full sized Sword Of Sherwood Forest Blu-ray screen caps!